To make the chili sauce, combine the apricot preserves, crushed red chili flakes, pepper, and lime in a small bowl. Season to taste. Thaw shrimp according to package directions. Start with 3 medium bowls. Combine flour, salt, and pepper in one bowl. Beat the eggs in the second bowl. Combine Panko and coconut in the third bowl. Dip the shrimp into the flour, then the eggs, and then dredge the shrimp into the coconut mixing, pressing gently to adhere. You want a lot of coconut on each shrimp. Set the coasted shrimp aside on a plate as you coat the remaining shrimp. Add enough oil to cover the bottom of a large skillet on medium heat. Fry the coconut shrimp in batches – do not overcrowd them in the pan. I fried about 6-7 at a time. Flip after 2 minutes and fry the other side for 2 minutes or until golden brown. I like mine a little darker, so I fried each side for about 3 minutes. 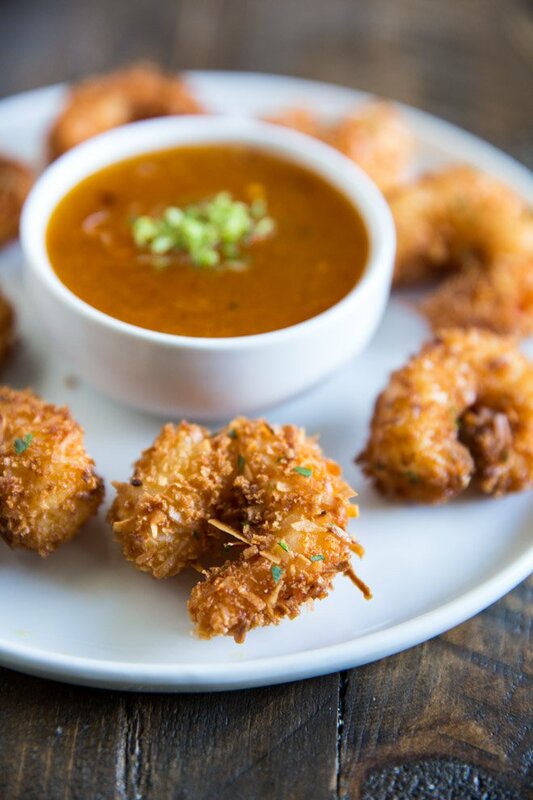 Place the finished coconut shrimp on a plate lined with a paper towel as you fry the rest. Serve with the Apricot dipping sauce.